Download Our App Before You Need It! Why Do You Need an Accident App? Being involved in an accident is a traumatic experience, and even more so if there are injuries. It makes it difficult to think about what to do. You know you need to write things down, but you can’t remember all of it. Imagine if you had a free phone app that told you step-by-step what to do? Imagine that it was already downloaded and ready to go. You don’t have to wonder how to get something like this. David Azizi has already developed an accident app based on his experience as a personal injury lawyer in Los Angeles. This free phone app has everything you need at the accident site. David Azizi’s Auto Accident App lets you get all the information you need to document how the accident happened, who was involved and who saw it happen. Think of it this way: every piece of information about the accident will be important later on, and you are the one to gather it together. if you are physically able to do so. David’s app lets you do that easily, and keep everything in one place. No searching for a scrap of paper to write down the other driver’s name and insurance info on or looking for it later on. Instead, with the Accident App, you’ll have it all together, and you won’t miss a thing. Being prepared for calamity is something prudent drivers think of ahead of time. 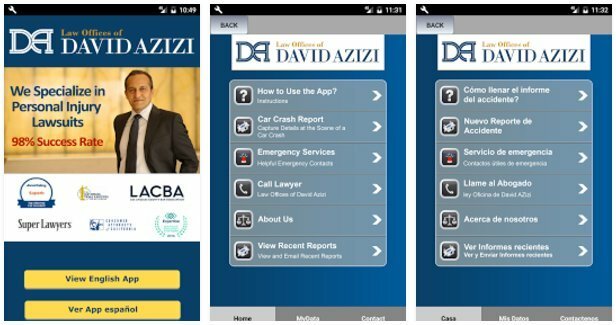 Downloading David Azizi’s Auto Accident App lets you do that easily on your mobile phone. Carrying it with you gives you the security of knowing if something happens, you can handle it, and ensure that you and your family are protected.